Kashmiri Diaspora holding a protest demonstration in front of the United States White House. As five bodies were piled up by forces in north Kashmir’s Kupwara district, within days this early spring, shockwaves spread everywhere. Overseas housing Kashmir Diaspora was feeling no different. 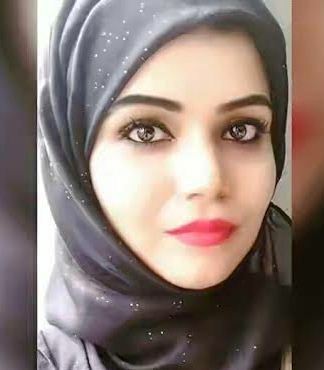 Amid mourning mood, a Srinagar girl putting up in Washington came up with an initiative, thus preparing the stage for what later became a global candlelight vigil against Handwara killings. By the time, Sanna was mature enough to realise the political reality of valley, she began spreading word about it at her own level. 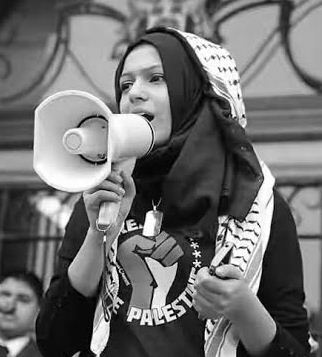 Sanna shortly realized that she wasn’t the only ‘foot-soldier’ of Kashmir cause. But still, talking about it was enough to make her feel contented. But the fresh bloodbath in Kashmir made her think beyond lip-service. “When I heard about the Handwara incident,” says Sanna, “I could feel my blood boiling with pain and anger. I wanted to shout to every corner of the world to stand in solidarity to these five precious lives that got killed and the minor who was allegedly sexually harassed.” Out of this intense moment, idea of candlelight vigil popped up in her mind. Initially the idea was limited to Washington D.C, but in next two days, she succeeded in spreading the word around to hold this vigil in every country on Friday, April 22, at 8:00 pm local time at their respective places. But before the big evening, Sanna, the daughter of Kashmiri engineer-turned-handicraft businessman in US was busy shuttling between her daily routine and her ‘beloved’ raison d’être revolving around Kashmir. With bludgeoning sense of ‘grief’, she began spreading awareness about Kashmir’s chequered history. “Though I am a mixture of American and Koshur culture, but I always carry my home inside me. 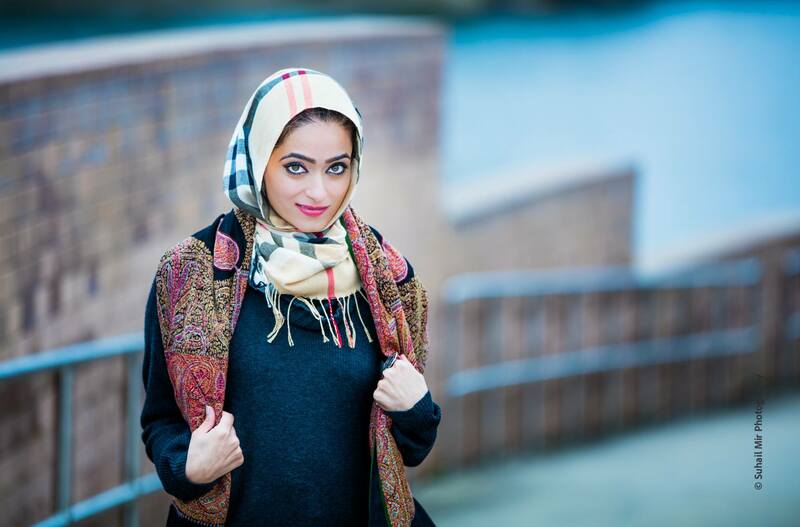 So, it is natural for me to bat for it.” Being a fashion stylist and an upcoming fashion designer, Sanna plans to incorporate Koshur work in contemporary modest trend of style. But her ambitions apart, her candlelight vigil didn’t take much time to turn into a far-cry. By the time, it reached London it had mobilized sizeable support, spearheaded by her namesake ‘poster girl’ of Kashmir’s global dissent. It was raining in London on the evening of April 22. But it didn’t stop Sanna Sultan to be ‘the lady with a lamp’. “Once we got to Trafalgar Square,” says Sanna, originally hailing from “Azad Kashmir”, “the team of around 10 of us got involved in setting out the candles in the shape of map of Kashmir.” Whilst doing this in rain, they all spoke about Kashmir. It was with the same spirit that motivated Kashmiris in Canada, Australia, Brussels, Oslo and other places in European Union besides in Bangladesh, Nepal and Gulf countries to be part of it. Even Indian cities of Chennai and Mumbai hosted the event. In two capital cities of undivided Kashmir—Srinagar and Muzaffarabad—the candlelight vigil evoked the global enthusiasm to condemn Handwara killings. That evening, Dhaka was still sweating under the harsh sun, even though it was setting. But that didn’t prevent Ain Wani and her co-organizers to come out with their candlelight vigil. Wani and others started with a silent protest in front of Raju Vaskorjo, Dhaka University before moving inside the campus. “We discussed the Kashmir conflict, the possible solutions and our responsibility towards the conflict,” she says. Around 8 pm, the Dhaka gathering moved to Bot Tola field where they held a candlelight vigil as a sign of global participation. “And the event concluded by lightening up some sky lanterns,” Wani says. When all this was happening in US, UK, and Dhaka, Australia was also gearing up. At Sydney, along with Kashmiri men, scores of women turned up to be the part of the event. Along with Kashmiris, some Australians, Pakistanis and Indians also took part. One by one they assembled before Sydney’s famous Town Hall area and demanded revoking of AFSPA, demilitarization, punishing the guilty and autonomous Kashmir. 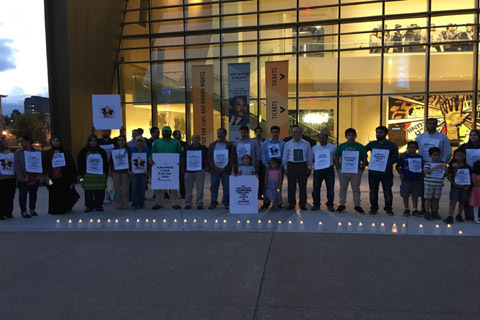 Candle light vigil held at the National Center for Civil and Human Rights in Atlanta on April 22, 2016. Over the period of time, many Kashmiri students in overseas have regularly rallied behind the Kashmir issue. What seems to have helped them lately to spread the K-word is the emergence of the alternate media, like Facebook, Twitter or Whatsapp. By using these social platforms, Kashmir Diaspora living in different countries remained in touch, besides discussing situation back home. 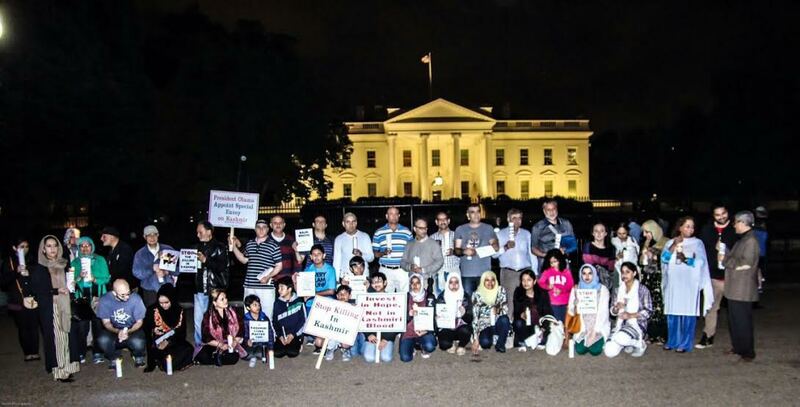 In Washington, as Kashmiri Diaspora led by Sanna Naqash stood contended after holding the vigil in front opf the White House, the gathering was beaming with gratitude for US government for allowing the vigil.